In Palo Verde, a student noticed this Leptophis mexicanus preying on a tree frog (I think it’s Smilisca baudinii). This is the second time I was able to observe a Leptophis attack a frog, although this occasion was quite different, given that the snake had captured the frog by the hind legs; the frog made distress calls and the snake had some difficulty dragging and controling its prey. Additionally, I’ve been feeding frozen rats to the two corn snakes I’ve recently inherited. Below is 1 (that’s its name) gulping down a rat. Rocky, my pet Eastern Box Turtle, tends to sleep in peculiar positions. I’m rarely able to get my camera before he notices, wakes up and shifts positions, but I managed to snap this photograph of him using his bark home as a pillow before he awoke. Coral, my father’s new haflinger, was born in late May and I was able to see her for the first time last weekend. She’s excitable, curious and very pretty. Additionally, she likes here chest scratched – her eyes nearly roll back if you scratch hard enough. Coral stomps... she wants to play, not eat grass. 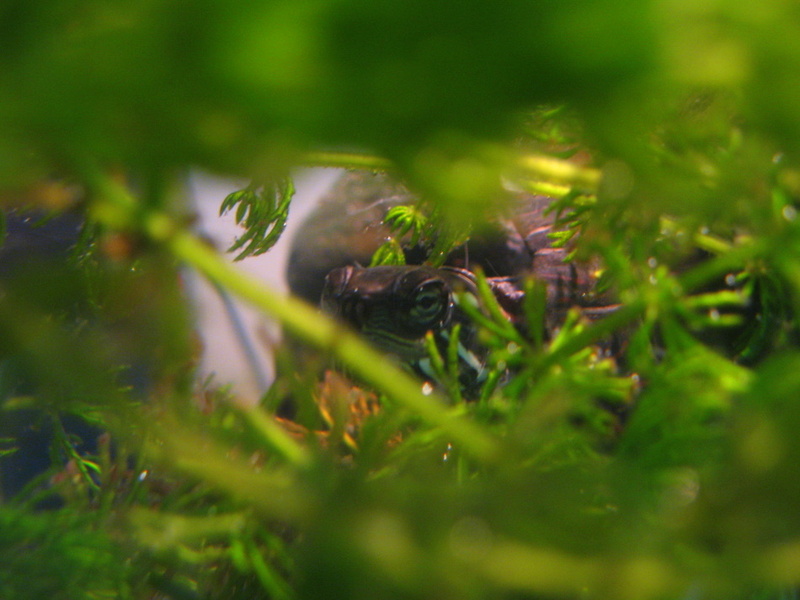 Emerged in ceratophyllum, Jamie cautiously peers through the aquarium glass to investigate a recently occurring series of flashes of light. This is Amber, my old yellow lab. Her love for water was kind of like that Meatloaf song; “But I won’t do that…” She loved swimming even if the water was below 50 F, which is exceptionally cold, but she would run away if there was a hose involved. Some introductory images of Patches (the miniture horse) and Chelsea (the Haflinger). They’re kind of like gigantic dogs; you can get them all excited so they run around in circles and attempt to jump on you. I think the only difference may be that they can’t put their tail between their legs while they run around.